Time to jump forward now, to Melbourne in March 2000. Yes, they are pink vinyl snakeskin pants and I'm not sorry. "The HELL were you thinking?" I hear you ask, in perhaps a more forceful tone than is necessary. Snakeskin was so in at the time, it's today's leopard-print. And one day, on my way home from work, I passed one of those cheapy Chinese chain stores with cheapy Chinese chain clothes in it and these were on a rack out the front (in various fun colours) for $18. "Well, I'm not spending $18 on such a frivolous thing," I thought. The next week, they had been marked down to $10 and the rest is Throwback Thursday fodder. 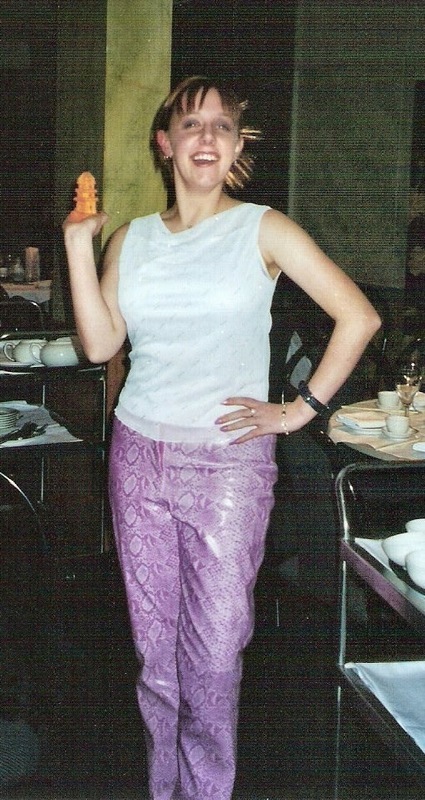 I remember I sat on them for a while (not literally) as there really aren't too many places you can rock a pair of pink vinyl snakeskin pants, even in the year 2000. Finally, an opportunity came up when we had a work "girl's dinner" so out they came, teamed with a white cowl-neck sleeveless top with glitter stripes and chiffon overlay (one of the few sleeveless tops I've ever loved), matching metallic pink nails, some silver jewellery, a Boy London watch, a horrible nylon fake hair scrunchie with pale pink bits in and sketchy fringe in full effect as always. Seriously, why didn't any of my friends ever stage an intervention?? It annoys me that I can't remember what shoes I'm wearing but I'll bet anything they were some type of platform. And what am I holding so proudly? It's a small Chinese temple intricately carved out of carrot, of course. I'm ashamed to say that I did, on a dare much later in the night, bite the top off it. Not entirely convinced it *was* carrot. Tasted kind of . . . waxy. An interesting fact about this night was that before we left work, we sat and watched Cathy Freeman win the gold medal for the 800 metres track at the Sydney Olympics (which helped me date the photo). The pants made only one other public appearance after this night at a "Shoot 'Em Up" cowboy/cowgirl themed event, styled with white button up shirt tied at the naval and a custom-made cowgirl hat with pink glitter stars on it that I still occasionally find amongst my stored stuff today. I do wish I'd kept them in The Vault as a historical piece though, just for the LOLs. Still I have a photo and now that I've immortalised it in Throwback Thursday history, so do you. My girls have a pair in khaki, picked up new with tags from an op shop for $2. Wish I could pull off this look. Haha, seriously - vinyl and all?? I do wish I'd kept these though! Oh they were EVERYWHERE, Janet - I don't think you could get a dressy top that wasn't chiffon/mesh/glitter in some way! And yes, glad I went for the pink, I remember a bright blue, red and a bile green as well . . .